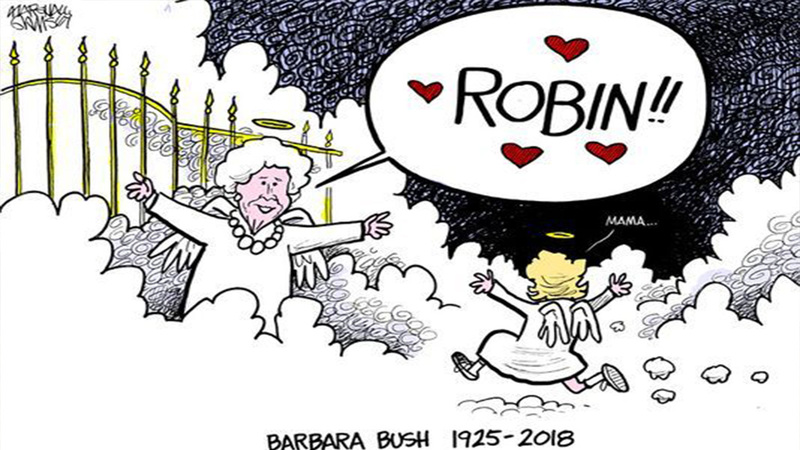 A newspaper cartoon depicting the sweet reunion between Barbara Bush and her daughter in Heaven is melting the hearts of social media users. It shows Bush, who died Tuesday after she stopped receiving treatment for her declining health, being greeted by daughter Robin, who passed away at the age of 3 from Leukemia. Ramsey, who started his career in 1988 at The University of Tennessee in Knoxville, has always had a fascination with the Bush family, as George H.W. Bush was the star in his first political cartoon. "I began my cartooning career at the University of Tennessee during the Bush Administration," he told 6abc sister station, ABC11. "So, I felt an attachment in a weird way. I've always admired her for her candor, self-esteem, toughness, and maternal protectiveness. I'm sure she wouldn't have liked many of the cartoons I've drawn about her husband and son. But she reminded me of my own grandmother." After hearing the news, Ramsey knew what he had to do, drawing inspiration from his own family. "I sat down in the morning, I thought about her life, all the things she is famous for (her wit, her toughness, her candor, and protectiveness) and was thinking how I could capture her life in an image. Then I thought about her as a mother and a story I had read recently about her and the president losing a child. I have three healthy boys but have had friends who have lost kids and know how devastating that is. No parent should ever lose a child. So, the idea of a reunion with Robin came to mind. I quickly sketched the idea I came up with and a couple other ones to pitch to my editor." After the cartoon was approved, Ramsey said it took off; it was even sent to Bush's granddaughter, Jenna. She posted the photo on her Facebook page saying, "Someone sent this to me-I don't know the artist but I love her. Miss you Gans." Ramsey saw her post and replied, "Glad you like it -- that means a lot to me. Your grandmother was like our grandmother," Ramsey said. "My heart is going out to you and your whole family today. What a special lady she was and what an awesome legacy she left behind. God bless you." The cartoonist said he's thrilled that his work is being well received online, even helping the family - and the world - mourn. "The cartoon has taken on a beautiful life of it's own," he explained. "I've been receiving e-mails and messages from dozens of parents who have lost children about how the cartoon brought them hope that they'd see their child again and what that reunion would be like. I can't ask for much more than that." After speaking with the Bush family, Ramsey offered them the original piece. Bush's funeral will be held Saturday in Texas.